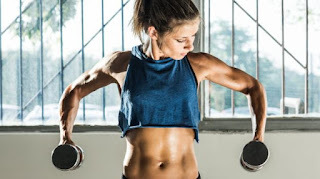 For the beginning we will give you some gym training tips, stick with them and you will succeed in the ultimate fight with your so-hated extra weight. The first thing you need to do is to perform a lot of endurance exercises ( like running, cycling, swimming etc. ). You need to do them regularly.. It is very important to lose some extra pounds.. and it is not so hard.. You just need to stick with your routine! Start your training with a light warm-up exercise – 10 minutes of endurance exercises (you can chose them, but the most effective is running). This is a one day training program. As a starter, you should go to gym for about 3 times a week. But remember to perform the exercises with LIGHT weight, due to the safety and effectiveness of exercises. If the exercises seem too though for you, just drop down on weights or repetitions. If you don’t know how to perform some of the exercises, just search the Web. Also in addition to training program, you can use some muscle building supplements, like whey proteins, or try out some fat burners. Good luck, and don’t go too heavy!